The ongoing unrest in Iraq has prompted international calls for Syria and Iran to work with Western powers in seeking an end to sectarian violence there. The White House has indicated it will consider talking to both countries. President George W Bush on Monday met members of an expert panel known as the Iraq Study Group, which has been re-evaluating US strategy in Iraq. UK Prime Minister Tony Blair is also expected to call for Syria and Iran to co-operate in a speech later on Monday. The UK Foreign Secretary, Margaret Beckett, has already said the two countries should be part of the solution instead of part of the problem. In a keynote speech in London, Mr Blair is expected to go even further, urging Iran and Syria to play a constructive role in securing a broader Middle East peace settlement. An aide said Mr Blair would "make clear to Syria and Iran the basis on which they can help the peaceful development of the Middle East rather than hinder it; and the consequences of not doing so". Mr Blair will speak to the Iraq Study Group via video link on Tuesday. "If they [the United States] really want to hold talks with Iran, they should officially propose it and then Iran will review it," Iranian Foreign Ministry spokesman Mohammad Ali Hosseini told Reuters news agency. The cross-party Iraq Study Group, due to give its recommendations by the end of the year, is believed to favour renewing contacts with Tehran and Damascus. 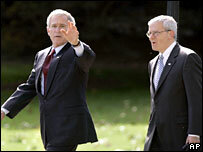 The White House chief-of-staff has said Mr Bush will look at all the options. Speaking on ABC's This Week programme, Josh Bolten said "a fresh approach" was clearly needed on Iraq. Asked if he favoured the idea of including Iraq's neighbours, Iran and Syria, in discussions, Mr Bolten said all options would be considered. 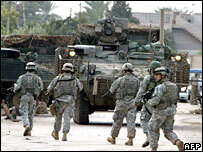 Iraq was seen as a key factor in the Republican defeat in mid-term polls and US defence chief Donald Rumsfeld's resignation. Senior Democrats have called for a phased pullout of US troops. "We have to tell Iraqis that the open-ended commitment is over," said Carl Levin, the incoming chairman of the Senate Armed Services Committee. He said he wanted phased troop withdrawals beginning in a few months and he said some Republican senators were preparing to back him. The Iraq Study Group, asked by Congress to examine the effectiveness of policy in Iraq, reportedly thinks that "staying the course" is an untenable long-term strategy. It is said to have been looking at two options, both of which would amount to a reversal of the Bush administration's stance. One is the phased withdrawal of US troops, and the other is to increase contact with Syria and Iran to help stop the fighting.